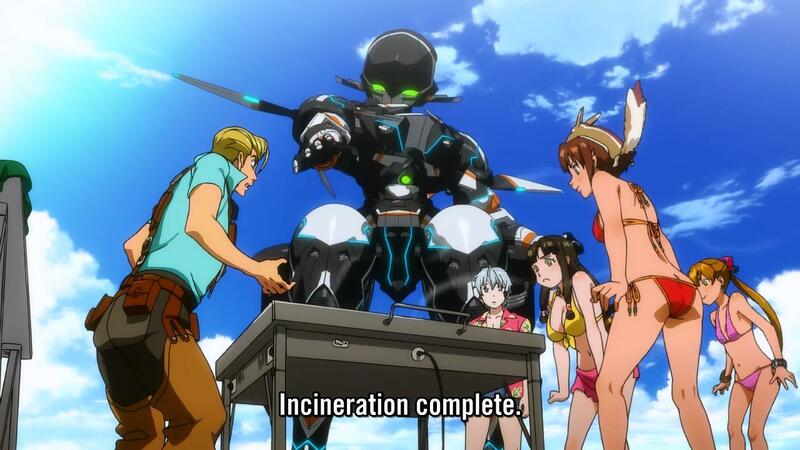 Suisei no Gargantia Final Episode: Chamber why?? What a tame ending…it seemed like everyone I talked with was expecting such a bloodbath. All we got was a…motor oil bath? It wasn’t a bad ending…I was kinda expecting it to be a lot worse. 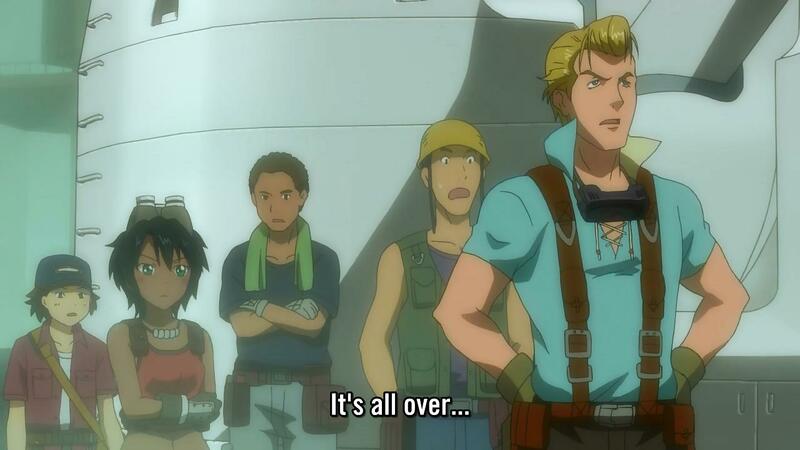 But I think we knew all along that it would somehow end with Ledo fitting himself into society at Gargantia. Author marthaurionPosted on June 30, 2013 Categories Suisei no GargantiaTags anime, gargantia2 Comments on Suisei no Gargantia Final Episode: Chamber why?? See? You all thought I was crazy, but the squirrel had a spy watching Ledo this entire time. And now, all-out war has started. 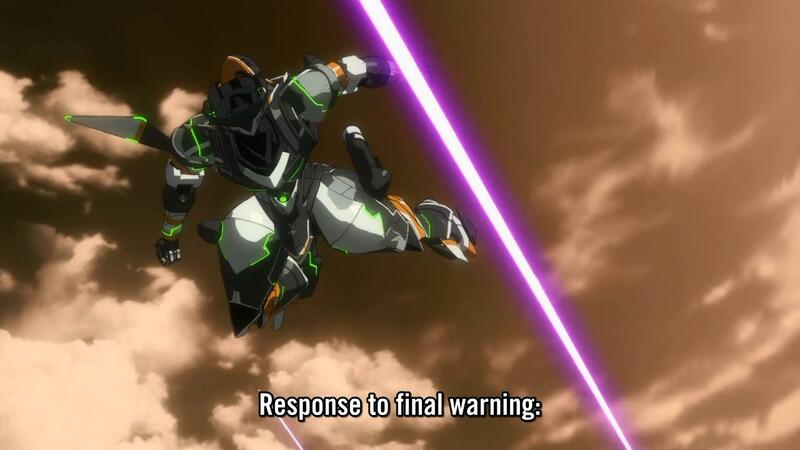 So far, Ledo’s side is looking pretty weak, but it looks like Gargantia is planning to reveal its secret weapon. 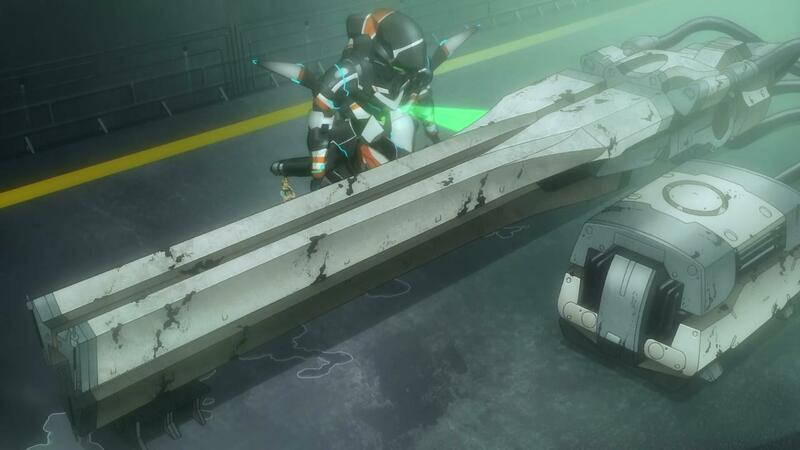 My guess is that it’s a Valvrave, but that’s just me. Next week, the final battle…Ledo has discovered that Striker is really behind all of this, so he gets to keep his pristine perception of his commander. And suddenly this has turned into a battle against a rogue AI. I’m still waiting for the sacrifices…who will be killed to finish this fight? Pinion? Melty? Amy? The squirrel? Well, the prediction seems fairly clear to me now. I mean…Kugel conveniently forgets to send out a distress signal to the Alliance? That was the first thing Ledo did…meaning he didn’t want to send it out. That can only mean his plan is to take over Earth with his dominant power over them. Assuming it’s a one-season series, that can only mean that he’s the primary villain. So now Ledo has to lead the rebellion against Kugel, right? He’s so submissive now…it probably means Pinion will be the one who convinces him to turn against Kugel. 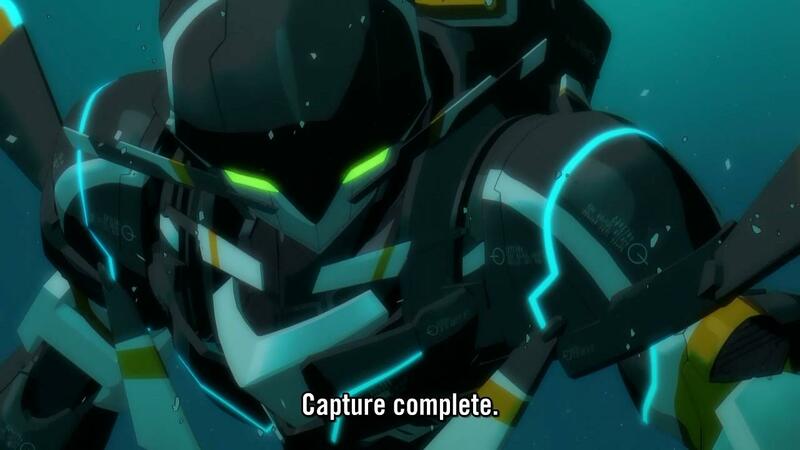 Surely he won’t be able to attack Gargantia, right? Next week, the confrontation will likely begin. 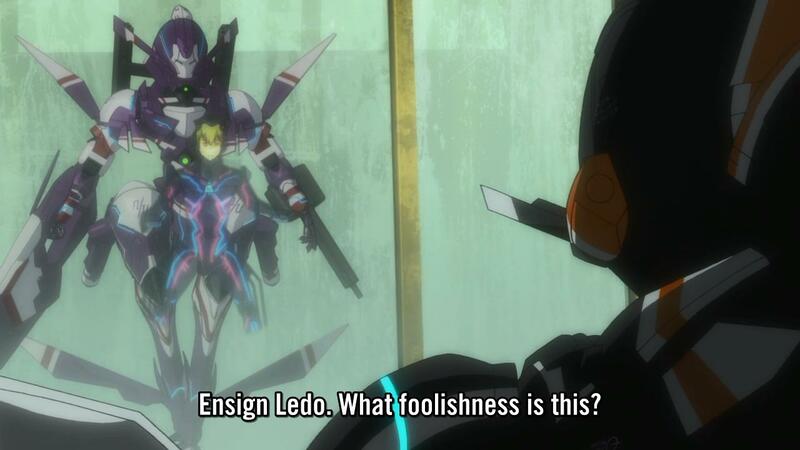 Interesting…so Ledo has decided not to go nuts with his new knowledge. Chamber has managed to convince him to continue his fight…that seemed almost too easy. On the other hand, Pinion is setting himself up for failure. He has no real power of his own and he’s kinda flaunting it. Has he even considered the possibility that Ledo might defy him? But anyway, it seems like the Alliance has finally found Ledo. But what are the exact circumstances? For all we know, the commander might be just as stranded as Ledo…the other possibility is that the Alliance is just chilling in orbit right now. I’m sure Ledo has an interesting story to tell next week. Well, finally we know the truth…it’s something I expected but dang…I just ignored the possibility up until now. I thought the Hideauze had been evolved from squids or something for testing…I didn’t think they were human. But what is Ledo to do with this information? It’s not like he can change things on a grand scale…he doesn’t have the authority or power. So maybe he just gets rid of his vendetta and refuses the Alliance help when it comes? Or just flat-out shuts off the SOS. But that’s such a simple ending…it’s too easy. Surely there’s something more than that. Yes, excellent…everything is going according to the squirrel’s plans. Split them up and their forces will be weakened. They’ll never see it coming. But seriously…nothing really happens this week other than the fleets separating and the old commander’s funeral. Ridgett gets the leader spot, but isn’t fit for it…that sorta thing. I guess Ledo gets that stuff about basically being stuck…not sure whether that’s just supposed to dampen his hopes or if there’s something more to be gathered from it. It probably strengthens his resolve as he decides he can at least fight the Hideauze on Earth. Either way, next week, the battles begin. Suisei no Gargantia Episode 7: To war! 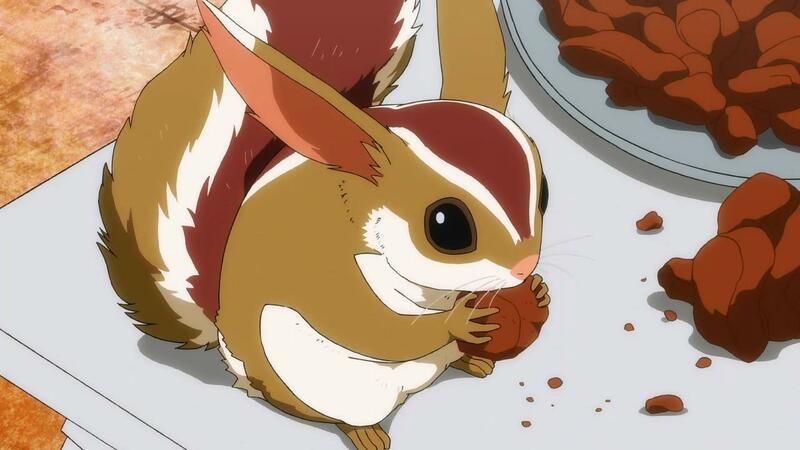 So, the show has finally decided to show its true face with the arrival of the Hideauze. The likelihood that this is an origin of the species is very high so far. The other possibility, of course, is Ledo’s theory that he brought them to Earth. That one’s strange, though, because they seem to have been around for a while before Ledo arrived (which is possible if the two fell into different points in time-space, though). Things can no longer be peaceful now…Pinion’s salvage quest seems kinda silly, but the split of the fleet was probably bound to happen. Now Ledo will return to being a soldier…so what will happen? Maybe Amy will decide to tag along. You stand in my way again, my nemesis? Author marthaurionPosted on May 19, 2013 Categories Suisei no GargantiaTags anime, gargantia7 Comments on Suisei no Gargantia Episode 7: To war! Oh hey…Ledo finally did something useful. And he’s found his true calling working in salvage? We’ve reached the halfway point of the show and the Hideauze have appeared again. Another misunderstanding? But Chamber identified it this time, not Ledo. I can’t imagine he’d be wrong. What does this mean, though? Does this mean the show switches to battle mode? Highly unlikely based on what we’ve seen so far…unless…it was the squirrel all along. I knew it. I think it’d be interesting if this single Hideauze was like some independently evolved Hideauze on Earth…like a new subspecies? And thus, Ledo is inducted as one of them. Next, he will realize that it’s all actually a cult for a bunch of people who worship the sun and are waiting for the Day of Reckoning when their god will incinerate all water on Earth and- wait…what? It doesn’t look like it’s that kind of show? What do you mean “it’s not that kind of show”? Why wasn’t I informed of this? I’m on your table eating all your food. Suisei no Gargantia Episode 4: Quick! Collect the water! More quiet life for Ledo…this is the sort of episode you would expect for someone adjusting to a quiet life after being constantly at war. The whole “he’s searching for a purpose in a world without fighting”. To be fair, though, he’s basically made Chamber do everything for him up to this point…so what exactly has he done? Don’t really know what to expect out of this show…it’s so slow. Nothing’s really happening. Is this the point of the show? Slow adjustment? Or are big things supposed to happen? I don’t see all that many signs of stuff bubbling under the surface yet…so I dunno. 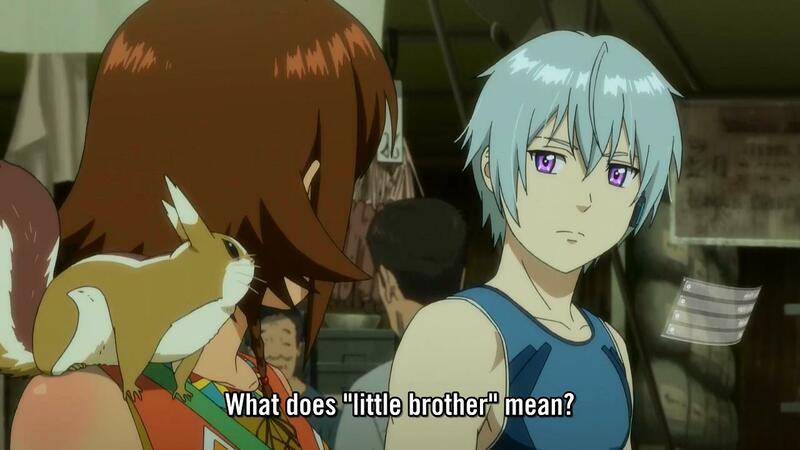 Author marthaurionPosted on April 28, 2013 Categories Suisei no GargantiaTags anime, chamber, gargantia4 Comments on Suisei no Gargantia Episode 4: Quick! Collect the water!